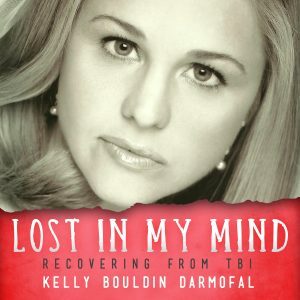 Lost in My Mind is a stunning memoir describing Kelly Bouldin Darmofal’s journey from adolescent girl to special education teacher, wife, and mother – despite severe Traumatic Brain Injury (TBI). 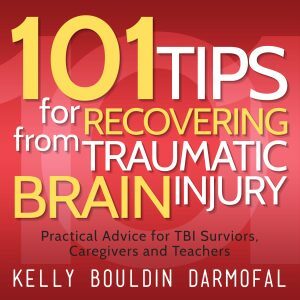 Spanning three decades, Kelly’s journey is unique in its focus on TBI education in America (or lack thereof). Kelly also abridges her mother’s journals to describe forgotten experiences. 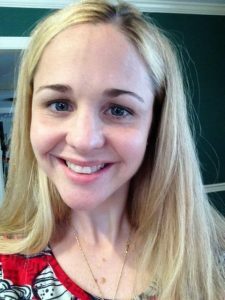 She continues the narrative in her own humorous, poetic voice, describing a victim’s relentless search for success, love, and acceptance – while combating bureaucratic red tape, aphasia, bilateral hand impairment, and loss of memory. Great for listening to again and again. No need to worry how much information you are retaining. My name is Kelly (Bouldin) Darmofal. I was in a car crash in 1992 and suffered a severe closed head or traumatic brain injury. I was thirteen days into my high school career, and had just finished cheering at my first JV football game. When I returned home for the night, several friends wanted to drive me to a local fast food restaurant to grab a burger. I was famished and my parents acquiesced, giving me a curfew of 10 PM. I was always super punctual and overly responsible. Thus, at 10:05 my parents worried… At 10:10 my parents began freaking out. After making a last minute – completely out of character – decision to allow me to go out with friends on a school night, my mom and dad had no idea where I was. At 10:15 the telephone rang. I had been in a car accident and was at Baptist hospital fighting for my life. Fast forward 25 years. I’ve recovered and found a “new” normal. I have a husband, son, relatives and friends who fill my world with love and laughter. I have meaningful work and am able to advocate for TBI (Traumatic Brain Injury) survivors in my free time. I’ve professionally published two books, Lost in My Mind: Recovering from Traumatic Brain Injury (TBI) and 101 Tips for Recovering from Traumatic Brain Injury: Practical Advice for TBI Survivors, Caregivers and Teachers, and will occasionally speak about my experiences with TBI. Hopefully, this blog will give me a new avenue on which to offer assistance.